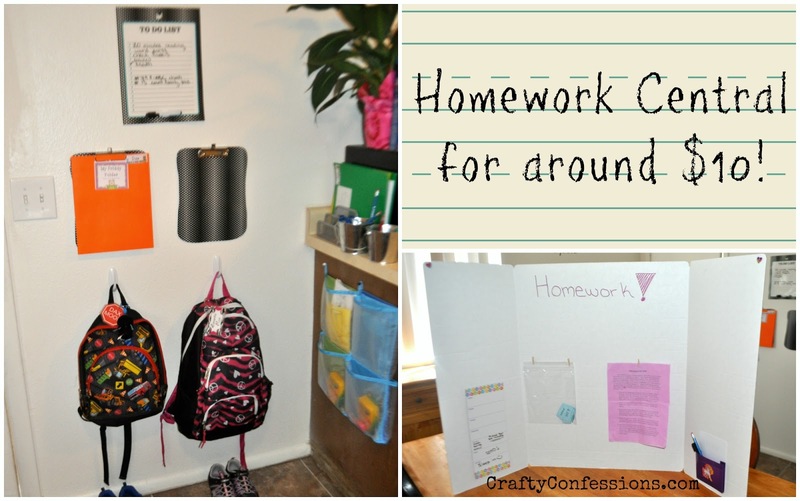 Homework Central for Around $10! It is back to school in the Moon house and we have two in school this year! I noticed right off the bat that my nice, tidy house turned into a whirlwind of backpacks and papers the moment the kids walked through the door. That was NOT going to work for me. I had set up a little hook and white board system at our old house, but that just wasn't going to cut it, so I hit Pinterest for some inspiration. There were dozens of great Pins that basically consisted of the same things: A backpack hook, a place for papers, and a dry erase board. We're on a budget, so my first stop was my favorite place: The Target dollar section. I picked up two black and white clip boards to hold assignments, a matching dry erase board with a marker, and two tin pails with chalkboard decals. The grand total was a whopping $5! While I was there I picked up a tri-fold project board for $2.50. My next stop was Dollar Tree where I grabbed a small dry erase board and a plastic pocket from the school supply section. I already had two adhesive wall hooks in my stash. The backpack/homework station is pretty self explanatory. I hung the clipboards, dry erase board and hooks near the back door in our kitchen, and set the tins nearby. 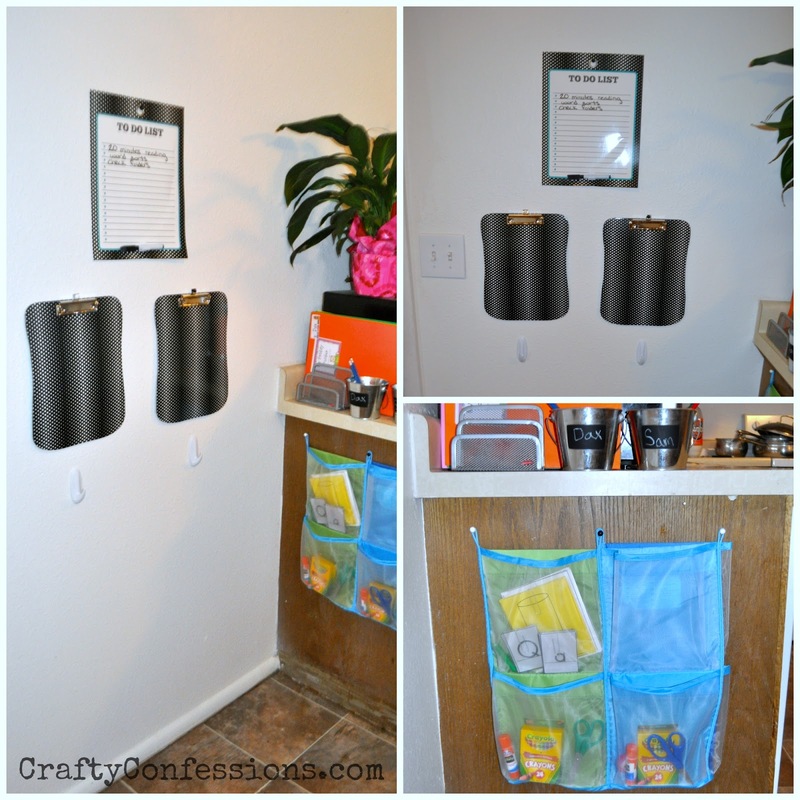 I also added some wall pockets we picked up from Ikea for around $4 last winter. 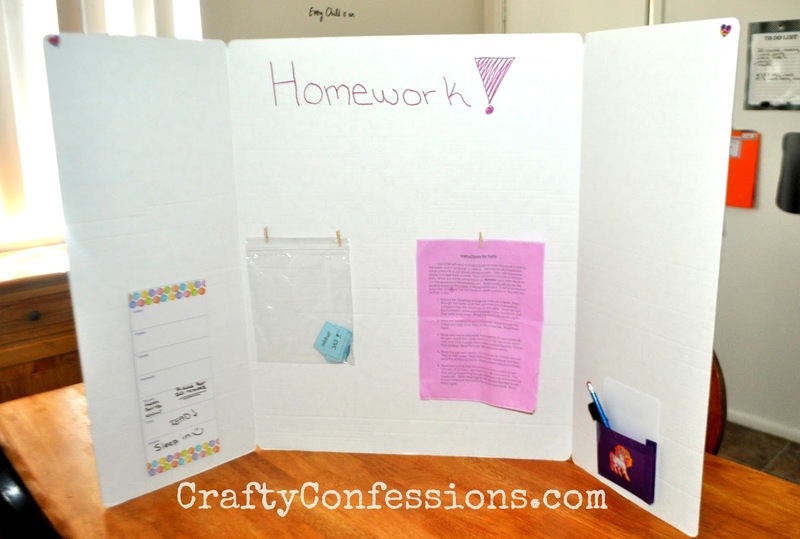 I made a quick homework "cubical" with the tri-fold board, and attached the pocket and dry erase board to the sides with hot glue. This was literally a two minute project that cost under $5. There you have it. A project that cost around $10 and took less than 20 minutes to set up will save me hours of nagging my kids to clean up their school stuff and help them stay on track for the school year. A very soft truly feel together with bright appearance provides a numerous capture the fancy of any one single what person wear replica u-boat watches. A good shopping bags in most cases is supplied in relaxing designs utilizing countless alluring together with inspiring motifs together with variations for example flower, four-legged friend, geometric or simply summary artwork and many others dior handbags for sale you could use. Any replica gucci bags scarves own world talent utilizing great variations together with elements. The simple joint of material on their own is why many most women require a shopping bags. They're just amazing together with present a good woman's wonder. Also these truly feel positively beautiful at a woman's hublot replica watches. A good scarf goes over any shoulders surrounding the to come back together with quite often leads during the prominent. Days past have died anytime scarves were definitely implemented only so i can get secured within the freezing conditions. Scarves appearing created for all the things are usually damaged for that amazing cartier replica sale and utilizing office environment all set gear. Nowadays, scarves are used began offering rebates most of changing seasons, overall garments together with for any needs.